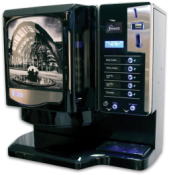 Trade Counter Coffee Machines, Look after your Customers with help from KSV Vending. This week sees more Classic in-cup machines installed at five trade counters for one of our major merchant customers. They recognise the benefit of providing refreshments either as a complimentary offering or at a competitive price as customers drop in to collect goods or place orders with them. With machine rentals from around £6 a week you can cost effectively look after your customer base with a choice of quality hot drinks including tea, coffee, hot chocolate or soup. 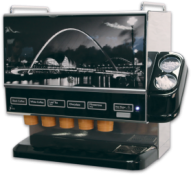 With a footprint of only 560mm x 360mm the Classic in-cup machine can sit easily on your trade counter or with the purpose designed base cabinet full flexibility on where to locate is available. We connect to a suitable mains water supply or you hand fill the convenient integral water tank and away you go. I know from previous work experience grabbing a hot drink at the same time as the days materials is often much appreciated. The chance of grabbing a PG Tips Tea, Gold Blend Coffee or Cadbury’s Hot Chocolate makes for happy customers. 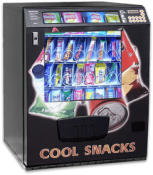 If you are not doing so already then look after your trade customers with help from KSV Vending. 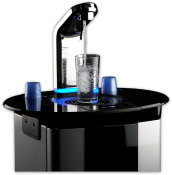 Visit the In-Cup section of our website or give us a call. 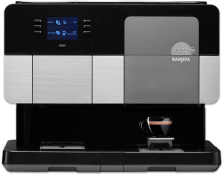 The Classic In-Cup Machine and Base Cabinet with Nescafe Branding.